Well everyone, I have been out of the blogger world for a little while now but I will be slowly getting back into it. I am all about organizing, planning, and making life as low stress as possible and for me the last few weeks my attention was needed elsewhere. We have a house now for sale and prepping it, cleaning from top to bottom, decluttering, yardwork, painting and the many other items involved in getting everything ready on top of the normal mom housework and child-rearing, I was not able to set aside time for my blog. But Im back! Maybe not full force yet but you will be seeing more from me. And I think a few posts on getting your house ready for sale may be in my future. I have a confession to make. I am overwhelmed with everthing going on in our household right now which has left me rather less than perfect in other areas of my – strive to be organized life. We are going to be selling our house (hopefully it will go on the market in mid March), that in its self is quite stressful but we have remodeled our whole 2000 square foot house in the past 2 years of living here. Of course there are some projects left unfinished and less impressive that we would like. So we are trying to finish these projects; some large some small, meanwhile I am attempting to…. So there are a few, and trust me I didn’t want to bore you all with the long to-do list. But I so have no desire to cook which is something I usually really enjoy. Ugh, I can’t wait for things to slow down. But I also am not looking forward to saying goodbye to this house we have made ‘ours’ the past 2 years. Cost including tax was $3.81 for $63.78 worth of products. I kind of have this thing for using old stuff and repurposing items. I just finished putting this up today. The wooden brackets are from the old victorian corner trim that you would see on the outside of a house. Two boards that were very weathered found in our old barn. One wooden box, an old ammo box, one old grease box and a wooden barrel missing the bottom. all found in our barn. The desk is one given to me by my brother when he moved and i think he picked it up on the side of the road or at the thrift store. Total cost to me…8 screws and a little elbowgrease cleaning everything. I love it hope you do too. Post your great find and cool project pics, i want to see yours too! 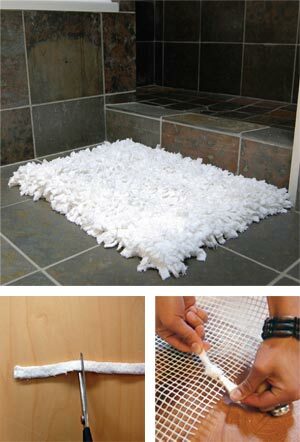 Another cool idea comes from Fine Craft Guild, make your own bath mat out of towels. Put those old towels to good use. cut up some bath towels and tie them around ‘graph n latch’, or gridded matting. This can be purchased at a craft store. I found some online at Joann’s in case anyone is having trouble finding it.